Speed is a crucial aspect of a website’s SEO performance. Have you checked it? We’ve all experienced the impatient ‘agony’ when we’ve clicked on a URL only to find that the page takes forever to load. Annoying as it is for users, who will often abort their visit, website speed is also used as part of popular search engine’s algorithms for ranking websites, otherwise know as SEO. According to Kissmetrics, two out of five internet users will leave a site if it takes longer than 3 seconds to load. Google as well as your website visitors, are well aware of this fact. The danger for slow websites is therefore a double-barrelled one; a high proportion of potential visitors abandoning their visit and being outranked in SERP performance by faster competitor sites. Here, we take a look at the two most popular tools to check your website speed with; Pingdom Tools and GT Metrix. Pingdom’s free speed check tools are immensely popular. It is this last tool that the company has earned itself a global reputation for and this free and simple test allows you to run a simple speed analysis on any URL. Basically, you enter the address of the site you want to test and then select a server location from one of seven options (2 choices in Europe, 2 in North America, 1 in Asia, 1 in Pacific and 1 in South America). In addition to the headlines, Pingdom also gives you a brief overview of ways to improve your page performance. These can range from avoiding URL redirects to adding ‘Expires’ headers and plenty in between. As free tools go, Pingdom is one of the best around for helping you get a snapshot of your site’s response times. However, if you decide to go premium, Pingdom Tools can offer a whole lot more including detailed visitor insights and effective alerts that give you immediate notification when things need to be optimised. Developed by the Canadian hosting provider GT.net, GT Metrix is another free website analysis tool that offers some powerful insights into speed and performance. For a free report, the analysis from GT Metrix is very detailed. Like Pingdom, you can access the tool for free but the service may take several minutes to respond as you will join a queue, depending on how busy their servers are. As with Pingdom, the free tools are immensely useful to indicate that there is a general problem and you do get some suggestions. But, again, you do get better analysis and more in-depth reporting if you switch to a premium service. 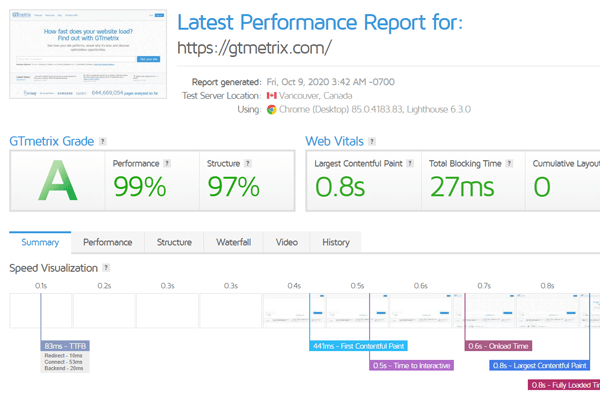 As well as more regular monitoring and automatic alerts, GT Metrix premium gives you detailed page performance specifically for mobile use as well as developer tool-kits and the ability to test your website from multiple regions. So, you’ve got your free reports from Pingdom and GT Metrix but how do you implement the changes? Well, fortunately both tools are pretty comprehensive when it comes to detailing the reasons why your site might be slow. This will differ by URL but the common reasons can be easily addressed by your website developers. Internet users want fast delivery from websites. If you’re not happy with either of these tools, it may be worth reviewing the data provided by Google PageSpeed Insights. Here at Opace, we’ve not found this tool to be as useful as Pingdom and Gt Metrix in terms of the recommendations provided, but it can provide some interesting data. Lastly, it’s important to ensure your hosting account is suitable for the size of your website and that it meets your performance goals. Some larger websites may benefit from dedicated hosting or migrating their service to a Virtual Private Cloud (VPS). There are other factors to consider with your hosting platform, such as the Web Server (Apache vs Nginx vs LiteSpeed) and whether server-side caching (e.g. Varnish) is enabled. Hosting is a whole other topic of discussion, but if we could make one recommendation to help improve website speed, opt for a LiteSpeed server in your country of origin. Opace is a fully integrated digital agency based in the West Midlands offering clients comprehensive support to deliver optimised performance for their websites and SEO. When it comes to ensuring your business reaches its intended audience fast, we know our onions. To find out more about how we can streamline your website to deliver the ultimate performance, contact us today. Image Credits: Opace/Pixabay (OpenClipArtVectors), mohamed hassan/pxhere and GT Metrix and mohamed hassan/pxhere.